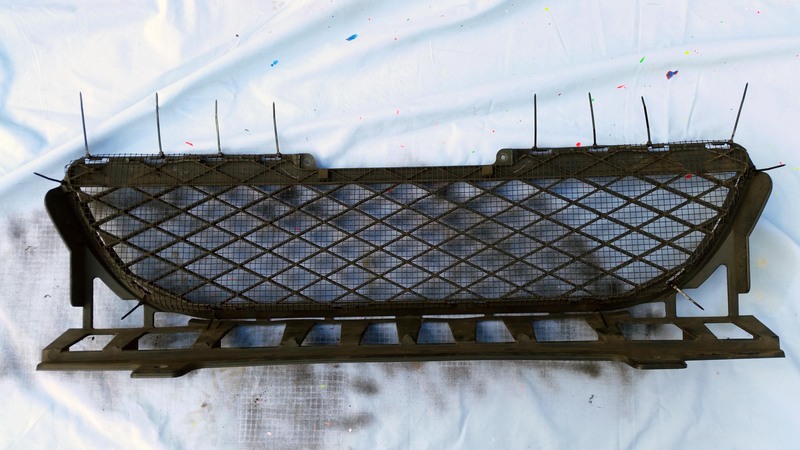 I thought I would post a quick guide on how to protect your Aircon Condenser from damaged. The Aircon in my Jazz hasn't worked for the last two years, I had it re-gassed when I first bought it back in Feb 2015 and it worked for a bit then stopped working. 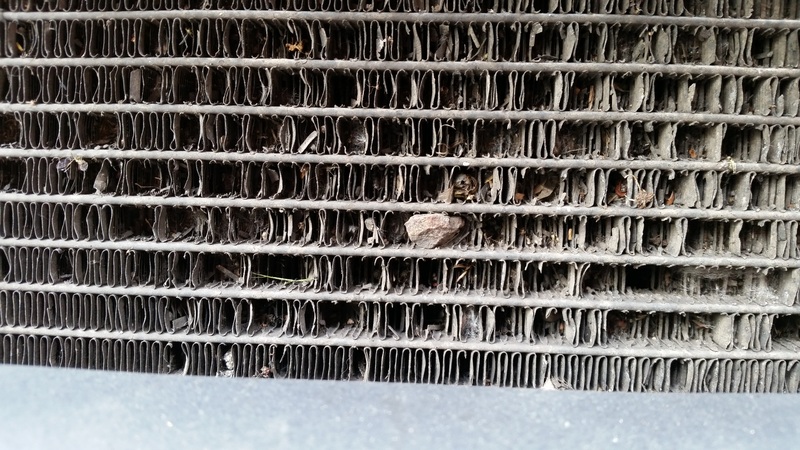 After a little research, I read that stones hitting the condenser was a problem with the Jazz, as the front grill offers very little protection from anything hitting the condenser. Well, with two hot summers without AC, I decided enough was enough, and the cars booked in to have the condenser replaced. 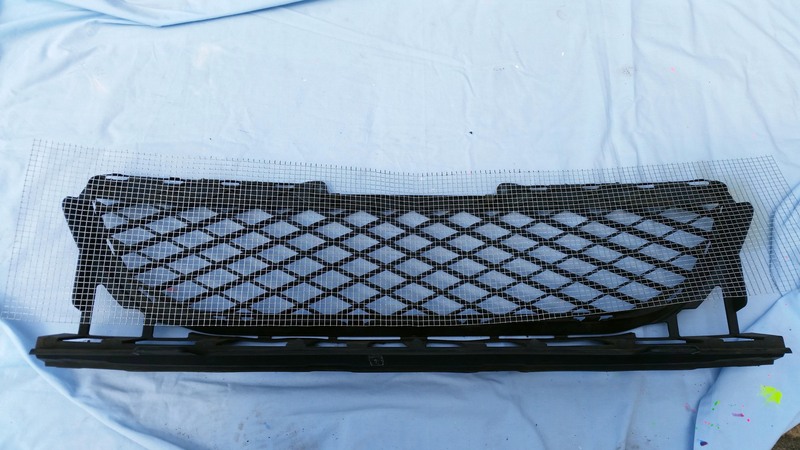 But I didn't want the same thing happening again, so I decided to modify the grill to protect the new condenser for the future, as I have no plans on changing the car any time soon. The whole thing cost me less than £10 to do, so it's well worth it to save £100s on a new condenser. Wire cutters (or anything that will cut through wire mesh). Good weather or a Garage. Firstly, you need to get the front bumper off, something I didn't photograph because I thought there would be lots of guides online. Pop the hood, remove the 4 plastic clips securing it from the top with a flat head screw driver. Under the front wheel arches, theres a screw either side, use a philips head to remove them. Underneath there are 6 plastic clips and two philips head screws. Once all that's removed, it should just pop right out. Next remove the grill from the bumper. It has two screws and a load of plastic bits which just need pushing back and the grill will pop out. 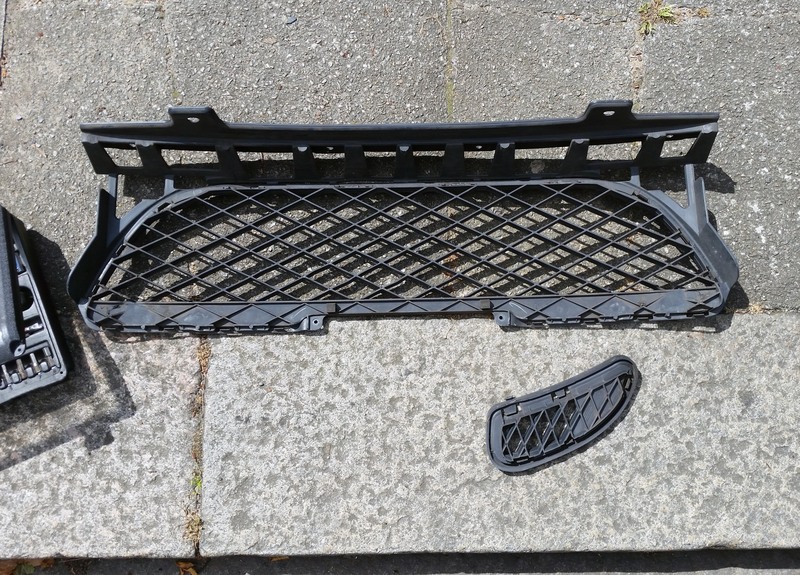 There are also 4 plastic clips attaching the bottom of the grill to the bottom of the bumper which need to be removed. The paint dried pretty quick in the hot weather, but I still left 15mins between coats to be safe. I did the same thing with the little mesh for the airduct. Barely even noticeable with the matte black paint. 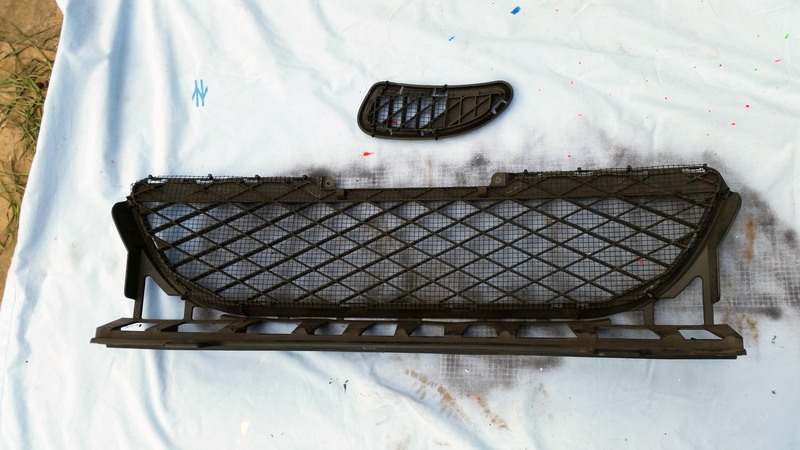 Painting is crucial if you don't want the grill to be noticeable. 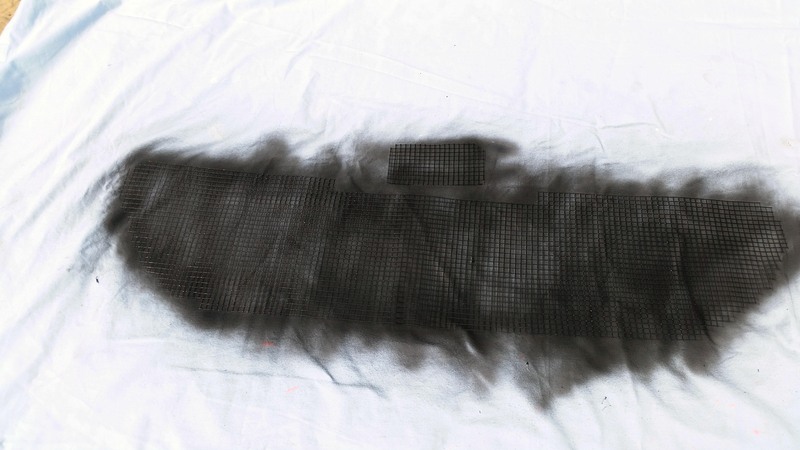 If you don't fancy spraying it, you could always use brush on paint, but be careful not to put it on too thick, we still want air to pass through the mesh ! 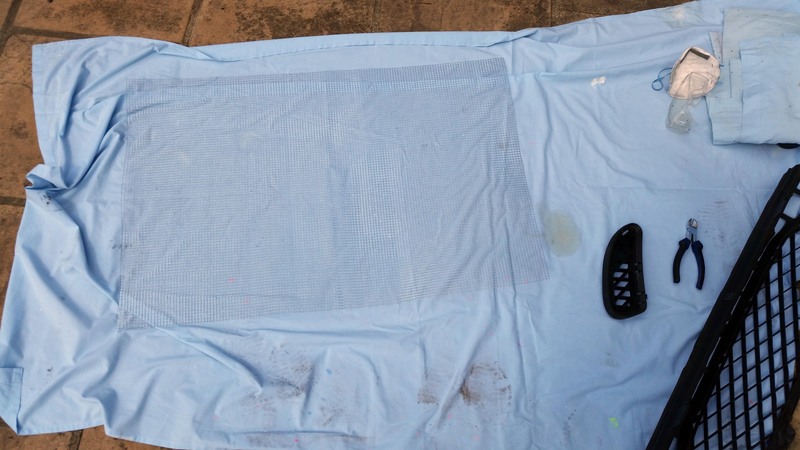 Or if you really don't want to do any painting, you could just use the black permanent marker to colour it black !! I hope this guide has been helpful. 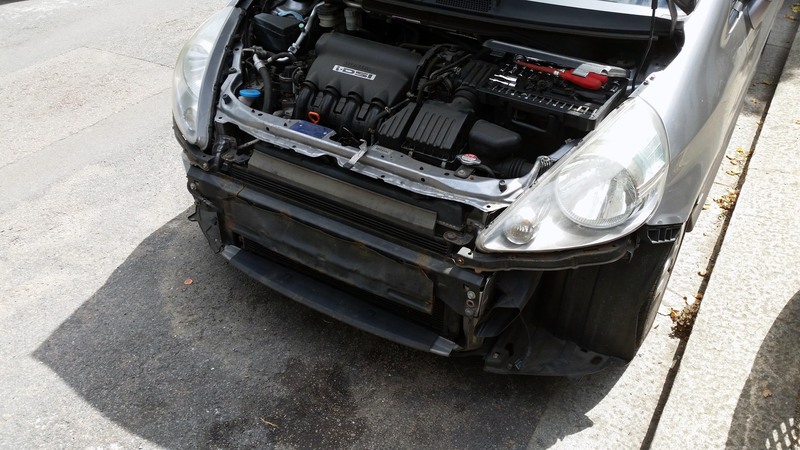 I'm sorry there wasn't more pictures or detail in removing the bumper. I originally only took the pictures for my own personal documentation. It was then afterwards I thought I should share it on here as a guide. I did this the lazy way on my MK1's without taking bumper off, used diamond aluminium mesh sprayed matt black and fitted it front of existing stays across the lower aperture with black cable ties - was always worried about the gaping holes in air intake with no stone protection, but also stopped insects, leaves and other crud getting in, which will block up radiator even if they don't damage it as such. 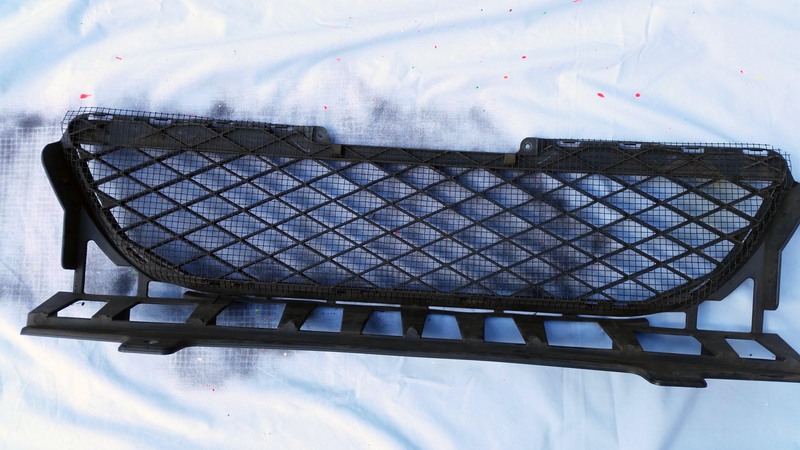 I'm afraid some people use pressure washer to clean radiators out, it will just blast the fins clear off the tubes. At least the facelift has some protection compared to the <2004 cars. How is the protection on the 2nd gen. Jazz? This looks a relative easy thing to do, which even i can. 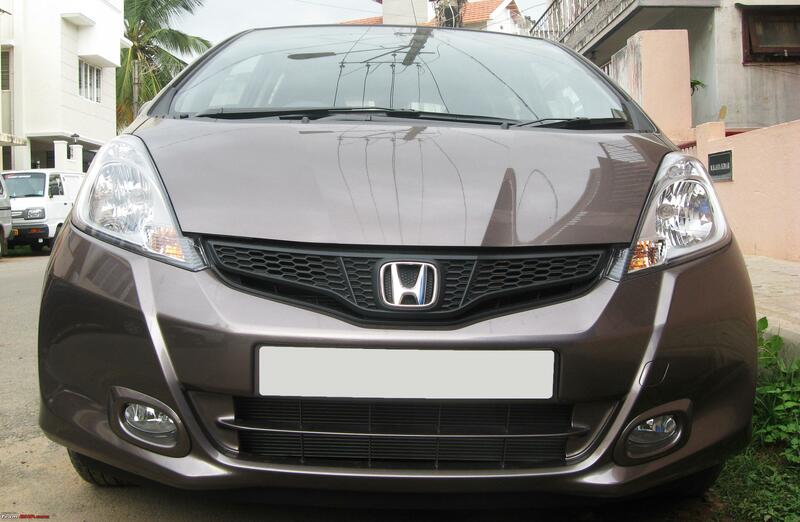 I have seen lots of protected Jazz's and Fits and other car makes on the internet where they make protection on both grill and the lower grill on the bumper, or is this only the lower grill? 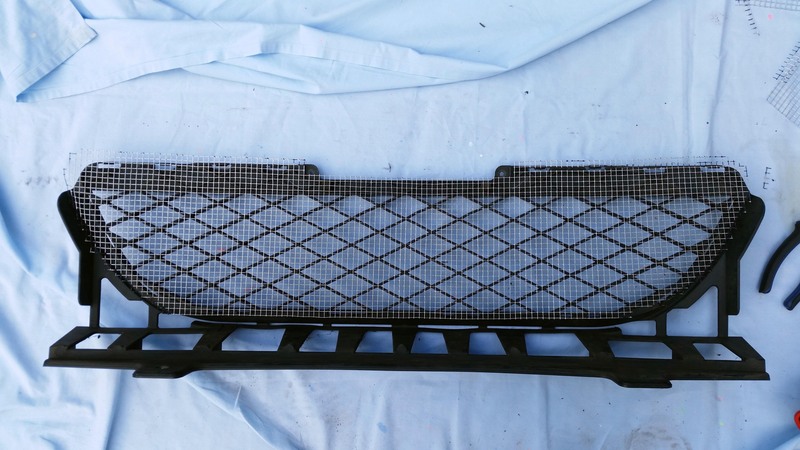 And my last question: I have also seen people using gutter guard mesh (black plastic), is that an idea instead of spraying aluminum mess, or are the holes to large of the gutter mesh? This mod is just for the lower grill. 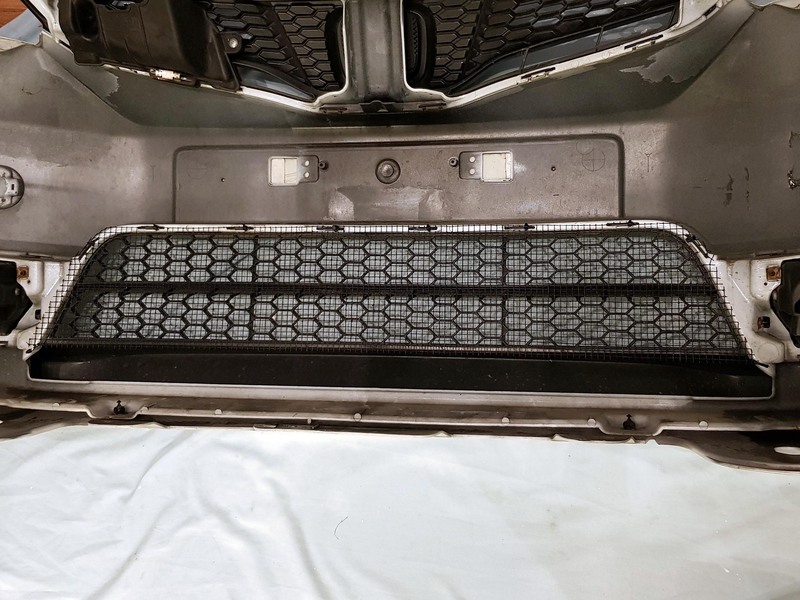 The higher grill on the GD has quite small holes, and there was zero damage behind it, so I didn't bother adding a mesh behind it. I'm sure plastic would be fine, but if you got a big enough stone hit the plastic, I would imagine it would be more likely to break and shatter than a metal mesh. So personally I would go with a metal one. I chose a hole diameter of 6mm because any bigger and I thought it would be more likely to let stones through, so as long as it's not much bigger than 6mm, It should work fine. 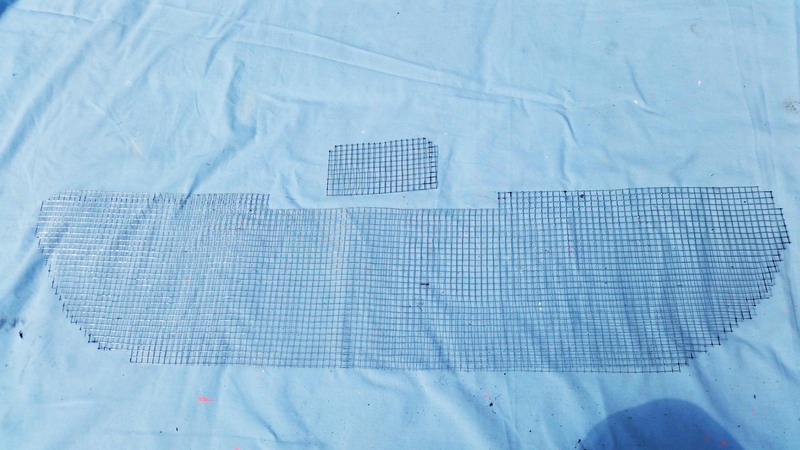 Then i go for the metal wire mesh! I have enough laying in our garage doing nothing and it's 5 (or maybe 6mm) and looks the same as you have used. Now i only need to collect courage to remove the bumper without damaging anything. Any chance of getting the images back in this how to guide? I wouldn't like to complete this mod. Try sending a PM to the original poster. Bloody Photobucket changed their terms so now you have to pay £33 a month to have 3rd party hosting, absolutely ridiculous! I've moved the images to a new hosting site and updated the post for you ! I am going to fit a solid panel in, to block the lower grill. I don't have air con, and a blank will promote faster warm up. My ScanGauge displays the engine coolant temperature, so I will be able to keep an eye on things. .... a blank will promote faster warm up. My ScanGauge displays the engine coolant temperature, so I will be able to keep an eye on things. Thermostat seems to kick in at 90°c on the GD and even that seems pretty rare, it very quickly pulls it back to 88° or so. You will probably be able to keep the thermostat on period to no more than 5% of total in traffic and probably 0% when driving at normal speed. Irrespective of weather and traffic I have never seen the temperature rise past 91°C. The ScanGauge records the maximums so I haven't missed anything. Usually it peaks out at 85°C. I have at last managed the modification to protect the condenser on my second gen Jazz. Being more than a little stiff taking off the bumper although simple was out of the question as getting under the front is beyond me these days. HOWEVER, I went down behind the top grill. 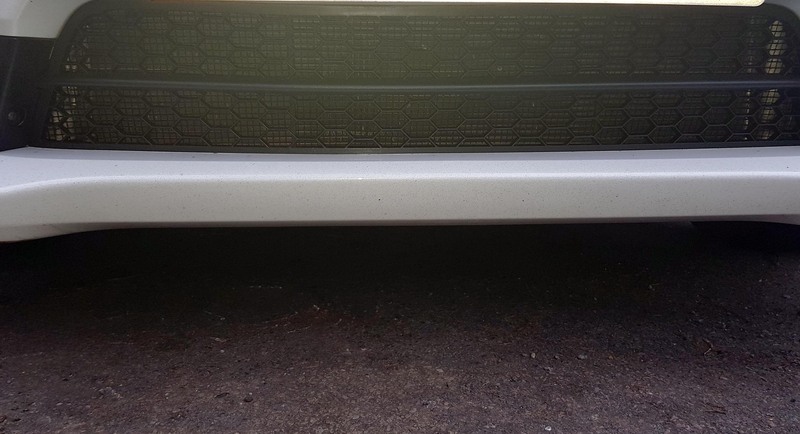 I made up a plate for the centre of the new guard, then drilling a small hole though below the number plate ( there is a blank piece of plastic on the upper level of the lower grill) then fiddled the new grill down. marked where the hole was. 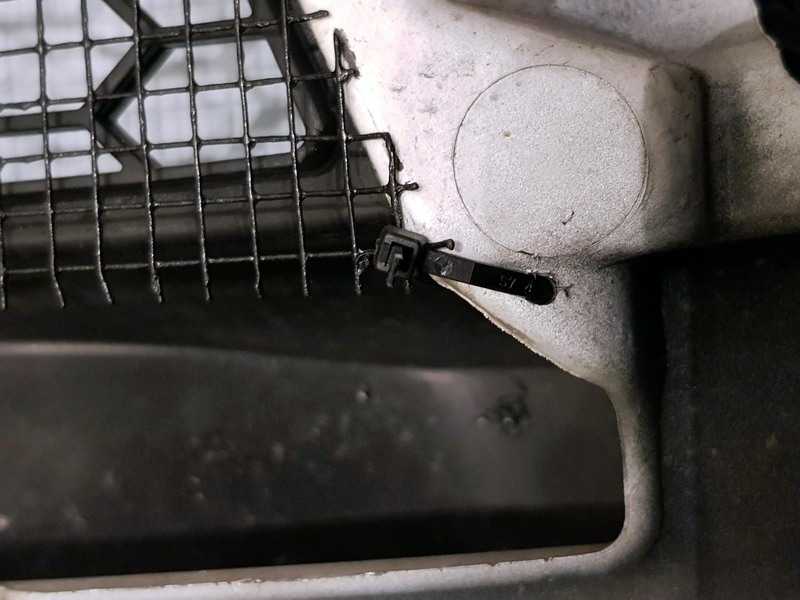 Then using a 5mm bolt, bolted it through the plate on the guard, With a bit of fiddling got the bolt through the hole in the plastic of the lower grill. Using a dome nut for appearance I secured the centre. I then used cable ties either side using the fog light mountings for security. All seems OK and you have to look to see any thing. Diamond mesh aluminium and matt black paint, a couple of cable ties ( I could have used bolts but age and tiredness intervened) and a 5mm allen bolt, washers and a couple of 5mm nuts. All done, I think £10 is well worth trying to save XXXX pounds of condenser. 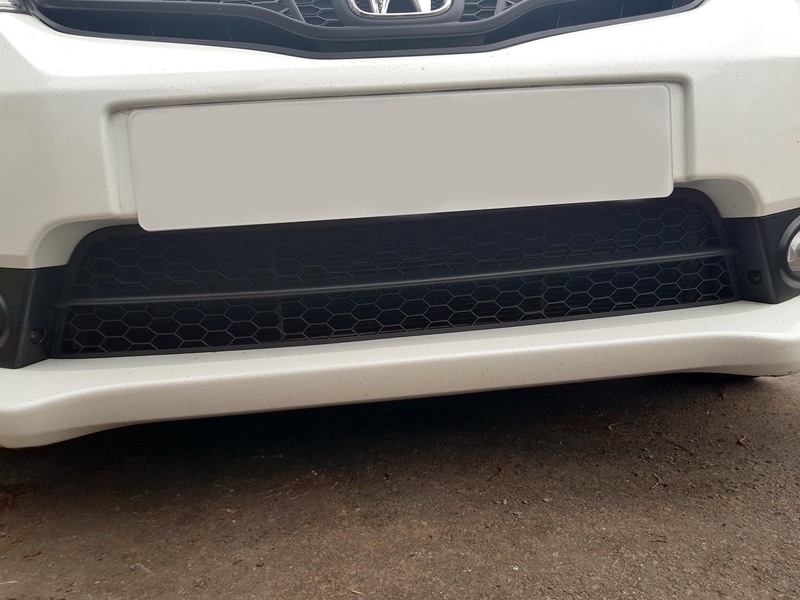 I did the grills on both our (now no longer owned) Mk1 Jazz with aluminium diamond mesh from B&Q sprayed black and held in place with cable ties, and did it without disturbing the bumper. I had Uri Geller helping me. he bent the cable ties enough so that I could feed them round and grab the end with a pair of medical crocodile forceps (very useful ). I've done the exact same Mod on my new 2015 Jazz Si. The newer Jazz is a lot more complicated to get the front bumper off than the old GD. I broke two clips, and lost a screw in the process. I will not be taking the bumper off again that's for sure! This time I painted it with some black metal paint I had spare, rather than spray paint. The coat is a lot thicker, so maybe it will last longer than spray painting. In order to secure the mesh at the bottom corners, I did have to drill into the bumper to feed a cable tie through. But this hole is behind the front lip, so It's never going to be seen. One thing I did differently this time, that I would recommend for people doing this mod, is I only secured the top and sides of the mesh, and not the bottom. This is partly because there is no where to secure it at the bottom (without drilling). 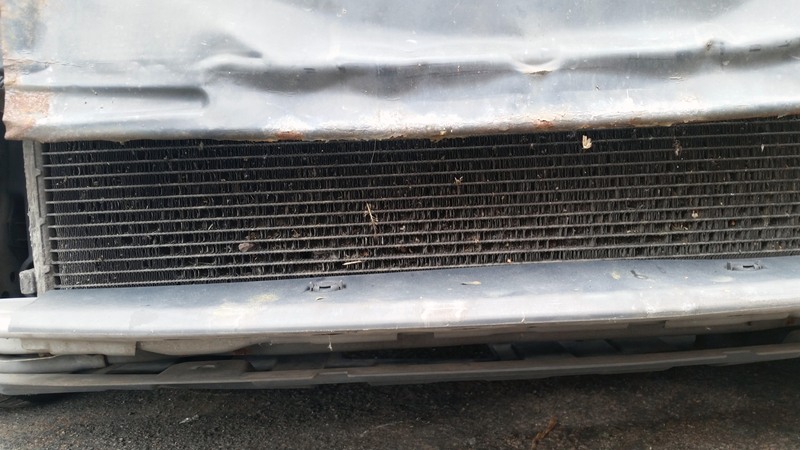 But I noticed with the mesh on my old GD, that debris like leaves would get stuck in the mesh, and because it is tight with the bumper grill, it would be difficult to get the stuck leaves and debris out. So by not securing the bottom, I can just tap it and theres now a big enough gap for the debris to just fall to the floor. It was actually quite difficult to take a photo where you can actually see the mesh, it's quite difficult to see, which is good ! Any questions about the Mod, feel free to ask !